Jaws – the landmark motion picture and a popular favourite here at Outsider – comes to Blu-ray for the first time ever on 3rd September 2012. 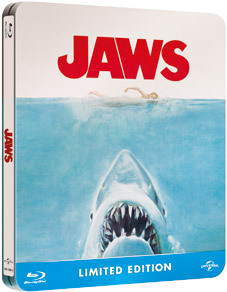 Featuring an all-new, digitally remastered and fully restored picture, as well as 7.1 surround sound, the Jaws Blu-ray with Digital Copy and UltraViolet gives fans what should be the best version yet of the definitive shark movie. One of the most influential motion pictures in modern cinema Jaws, in case you're somehow new to it, was directed by the then 28-year-old Steven Spielberg, produced by Richard D. Zanuck and David Brown and stars Richard Dreyfuss, Roy Scheider and Robert Shaw. The film earned an Oscar for composer John Williams' instantly recognisable score, as well as Oscars for Best Editing and Best Sound, and was also nominated for Best Picture. When it was first released in 1975, Jaws smashed box-office records and became the highest-grossing film of its era, earning Spielberg a reputation as a Hollywood visionary. Today, it remains one of the highest-grossing films in motion-picture history and is largely considered the film that launched the summer blockbuster. Jaws is one of 13 classic Universal films to be digitally remastered and fully restored from 35mm original film elements as part of Universal's on-going 100th Anniversary celebration. The Jaws restoration began with researching and evaluating the existing film elements to determine the best means to restore the film. Over the course of several months, skilled technicians at Universal Studios Digital Services meticulously balanced colour, removed dirt and scratches, and repaired any damage to the film elements shot by shot and frame by frame. Following the picture restoration, the Universal Studios Sound team up-mixed the soundtrack to DTS-HD Master 7.1, optimising the sound on the Blu-ray for the latest home cinema technology. The entire restoration process was conducted in conjunction with Steven Spielberg and Amblin Entertainment's post-production team to ensure the integrity of Spielberg's original vision remained intact. 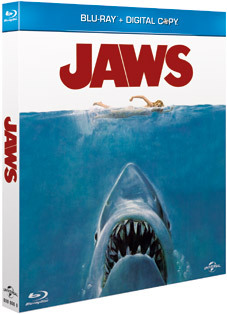 Jaws will be released on Blu-ray in the UK on 3rd September 2012 from Universal Pictures International Entertainment at the RRP of £24.99, and as a Limited Edition Steelbook edition at for £29.99. Advanced Remote Control: A sleek, elegant new way to operate your Blu-ray player. Users can navigate through menus, playback and BD-Live™ functions with ease. BD-LIVE: Access the BD-Live Centre through your Internet-connected player to access the latest trailers, exclusive content and more.